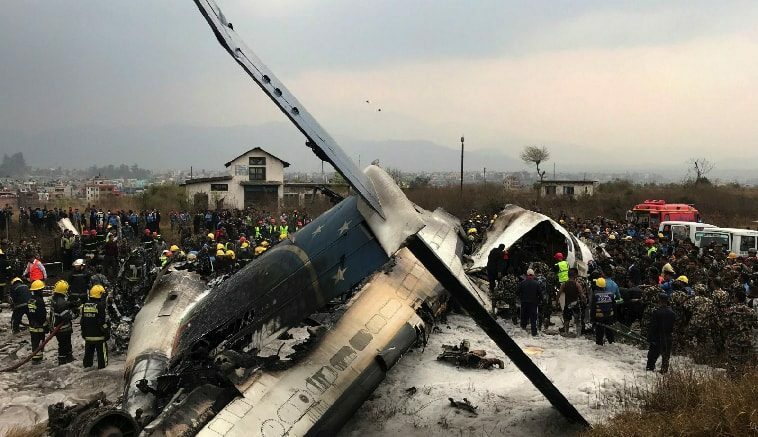 An aircraft that was carrying 71 passengers along with crew crashed before landing on the Kathmandu Airport and killed 49 people. The plane was burnt to ashes and the rescuers tried to pull the bodies from the charred wreckage. The plane was run by a Bangladeshi airline, US-Bangla. The airline is putting blame on the air traffic control but the airport authorities are telling that the plan approached from a wrong direction. Although the exact cause of the plane crash is still unclear Nepal’s PM has promised for an immediate investigation. There was a recording of the conversation between the pilot and the air traffic control some minutes before the crash and it suggests that there was some misunderstanding at the end of the sole runway on which the plane was about to land. This is a very unfortunate incident. The plane was flying from the capital city of Bangladesh, Dhaka and the plane was 17 years old. Twenty-two people are badly injured and they have been rushed to the hospital. The director general of the civil aviation authority, Sanjiv Gautam has been caught saying that the plane was permitted to land from the southern side but it landed from the northern side. The team is still investigating on the root cause of the wrong direction landing. However, the airline chief is blaming the Kathmandu air traffic control for not providing the correct information and he further added that his pilot is not at fault. The pilot was an experienced one and he cannot be at fault. For now, things are too dicey and Nepal already has much air crashes to its Pandora box. We shall wait for the investigation to come with some truth. Be the first to comment on "Bangladesh Plane Crashed in Nepal, killed 49 People"